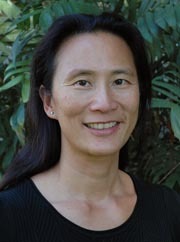 Nancy Chen will discuss her new book at 7:30 p.m. on Thursday, January 29, at the Capitola Book Cafe. Photo by Matthew Hutaff. Medical anthropologist Nancy Chen has a simple message for Americans who are obsessed with fad diets: Skip the gimmicks and listen to your grandmother. As a culture, Americans have lost touch with the nutritional knowledge that guided earlier generations, helping them maintain a healthy weight and shaping their dietary choices through times of illness and good health, says Chen, a professor of anthropology at the University of California, Santa Cruz. 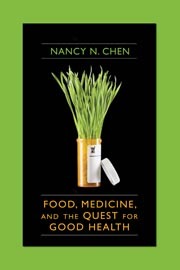 In her new book Food, Medicine, and the Quest for Good Health (New York: Columbia University Press, 2009), Chen breaks down divisions between food and medicine, and she underscores that medicinal foods are the "front line of healing." "Long before medicines were packaged and sold, people knew about the medicinal value of certain foods," said Chen, who has studied healing across cultures. "In many traditional systems, food is an important and accessible primary form of treatment." Cultural knowledge about the healing nature of foods that has been passed down through generations must be reclaimed, and Chen's hope is that readers will come to think about nutrition as an organic form of cultural knowledge, rather than solely a scientific undertaking. "If one is aware of dietary therapy, it's possible to practice it on an everyday basis, and not wait until one gets ill," said Chen. "Our health care system is in crisis, chronic disease is at an all-time high, and obesity is a top health concern. When diet is a primary element of wellness, it's not all up to the experts. We should consider health as an issue of justice and equality." In Food, Medicine, and the Quest for Good Health, Chen draws on medical texts and food therapy practices from around the world and throughout history to identify intersections between food and medicine. Some of those crossovers have had global consequences. For example, salt, sugar, and spices have been valued for their healing properties, and trade of these commodities transformed tastes, food practices, and the political economy of Europe, Asia, and the New World. Diets vary across cultures, of course, as do notions of what to eat on a daily basis and what to consume during illness. But Chen says the idea of balance runs across many cultures. "Illness is defined across many cultures as a need to return to balance," she said. Chen, who is Chinese American, says rice porridge and tea are staples of a traditional Chinese diet, and she notes that many cultures feature a simple, hearty mush-type meal of rice, wheat, or another grain. "It provides good sustenance at a basic level and alleviates richer foods," she said. The industrialized food wave that swept across the United States is now moving globally, spreading highly processed foods around the world, observes Chen, whose book includes a chapter on centenarians. From the Hunza Valley of northern Pakistan to Ecuador, centenarians subsist on simple diets of local foods and share a high level of physical activity and hard work, said Chen. "Although we in the West are constantly searching for the diet du jour, it hasn't solved the problem of nutritional illiteracy," said Chen. "We're seeing chronic disease that is avoidable on a scale that has never been matched before." Chen salutes the impact of food scholars who have popularized ideas about "localism" and "food miles," and she notes the growing democratization of the food system. "As an anthropologist, I tend to be very pragmatic," said Chen. " 'Locavores' are calling for the transformation of global patterns of food production and consumption. My hope is that we don't leave it up to institutions like the Food and Drug Administration or agribusiness, and that consumers have a voice in that transformation, which I believe is happening. Localism started to become popular about five years ago, and now more people are engaged with enacting these values. It's a good example of how change can happen." Note to journalists: Nancy Chen can be reached via e-mail sent to nchen@ucsc.edu.